Masdar City, Abu Dhabi, UAE: ‘e-tron’ is the nomenclature Audi has chosen for their fully electric vehicle lineup and the first birth in this tribe is the e-tron SUV that according to Audi has already gone to production and the company aims to launch the car for customers in the first quarter of 2019. 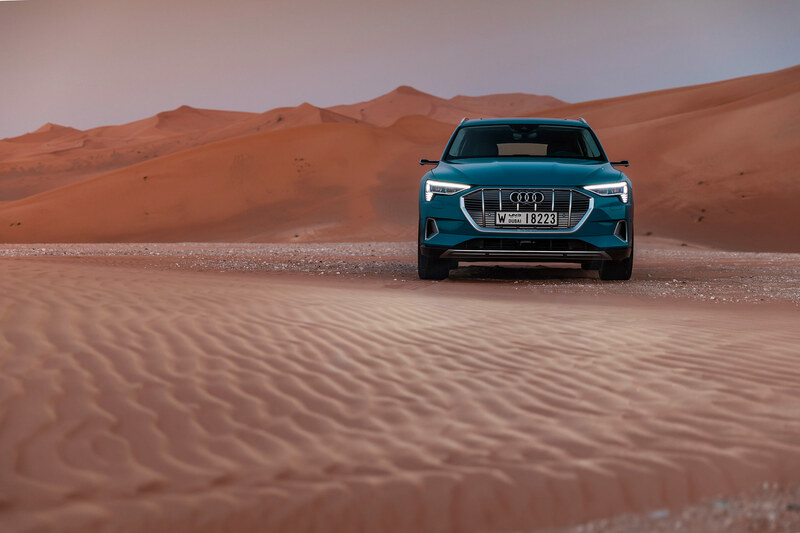 One of our favorite EV shows ‘Fully Charged’ flew to Abu Dhabi to give us an in-depth review of the e-tron SUV from the exterior, interior, driving-experience, battery tech, range to its off-roading capabilities in the deserts of the Gulf. Audi e-tron targets the existing Jaguar I-Pace, Tesla Model X and the upcoming Mercedes EQC & Rivian R1S electric SUVs as its main archrivals. Jonny Smith/Fully Charged is reviewing which seems to be the top-end variant of the Audi e-tron (video below), this variant has a 95 kWh battery pack that cranks out a 248.5 miles (~400 km) of WLTP range (bound to be lower in the real world). Jaguar I-Pace is able to produce more range besides having a smaller 90 kWh battery pack, also the Tesla Model X 100D has a significant range advantage over the Audi e-tron — looks like that e-tron’s ~2.5 ton weight is playing a negative role on the range here (see comparison table below). *Audi e-tron and Jaguar I-Pace Range estimates are WLTP based. Audi e-tron’s battery pack weighs around 700 kg (1544 lbs) which is about 1/3 of the entire vehicle’s curb weight. 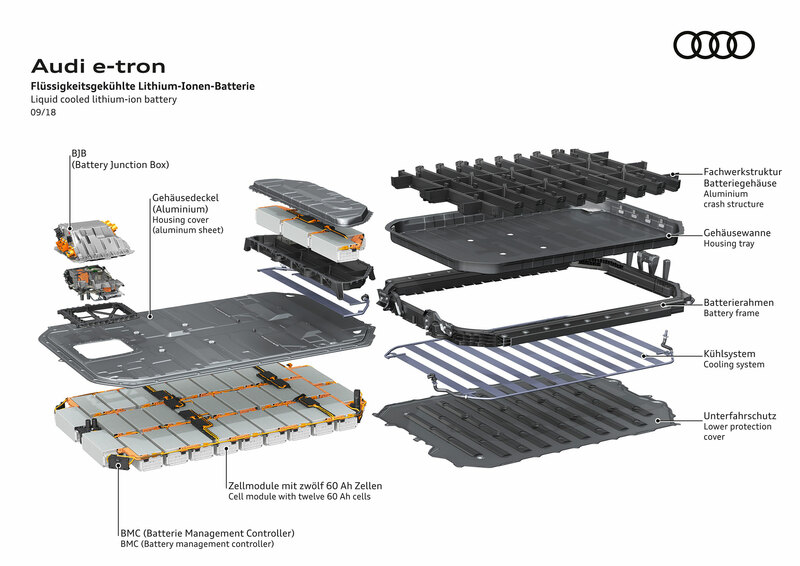 Audi seems to have fitted an extra 5 modules on the right side of the battery pack which looks like an afterthought, they call it ‘tier 2’ of modules (see infographic below), from Jonny’s review it’s unclear if Audi will trim-off these extra packs from the ‘Standard’ variant of the Audi e-tron. Perhaps Audi should have considered shedding the vehicle structure weight by using more aluminum but they used mostly steel, Jaguar I-Pace won the math here, light-weight more range with a smaller battery-pack. The 60 Ah cells for the e-tron are provided by LG Chem and Audi is producing the modules and the battery-pack at their Brussels car plant. The electric drivetrain motors and R & D is done at the automaker’s facility in Győr, Hungary. The Audi e-tron 55 Quattro (AWD) has a 140 kW motor at the rear and a slightly smaller 125 kW motor at the front axles, combined they provide a peak electrical output of 265 kW, we can see in the video review below that this All-Wheel Drive setup provides a great off-roading experience when coupled with the adjustable air suspension. 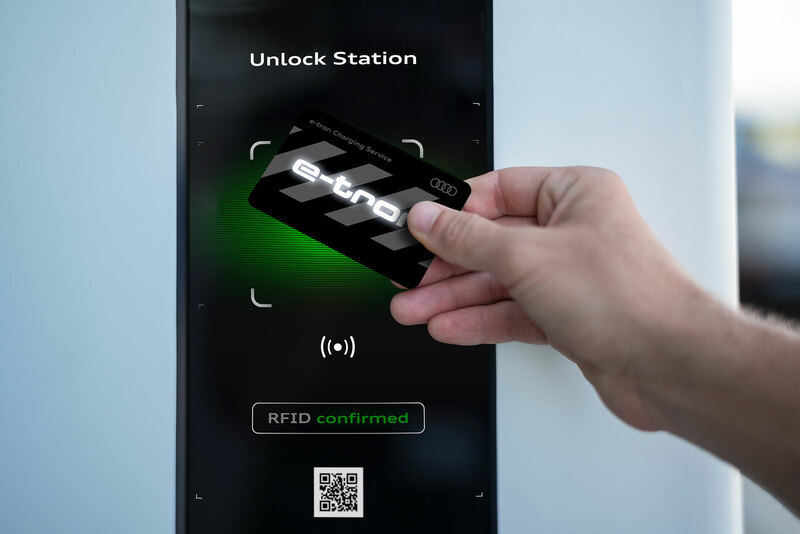 For any electric vehicle brand to succeed, a charging network or infrastructure is of as much importance as the product itself, earlier this month Audi introduced the ‘e-tron charging card’, which you can purchase for a basic membership fee (currently waived off for a year for e–tron customers, see below table for tariff details). 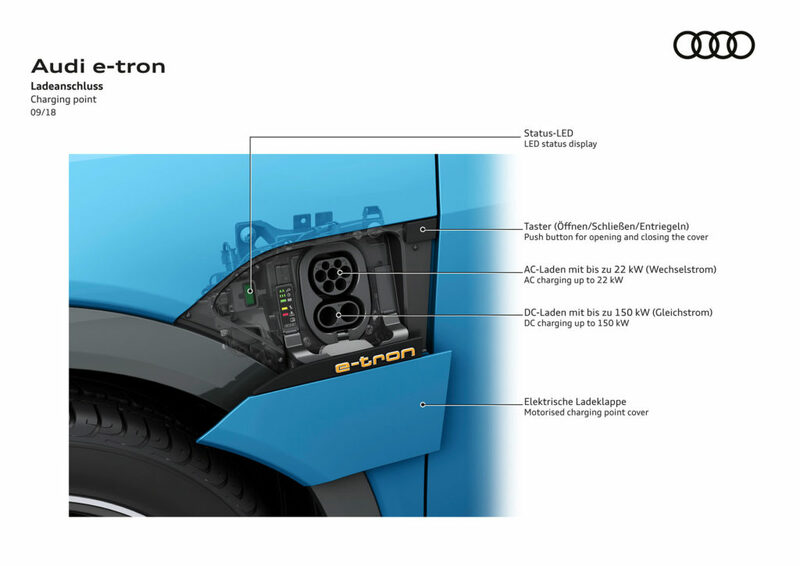 The e-tron SUV has two charging ports on each side of the vehicle — on the driver’s side there is a ‘Combined Charging System (CCS)’ charging point and on the passenger side there is a Type 2 charge port for taking benefit of the different type of charging networks and standards. 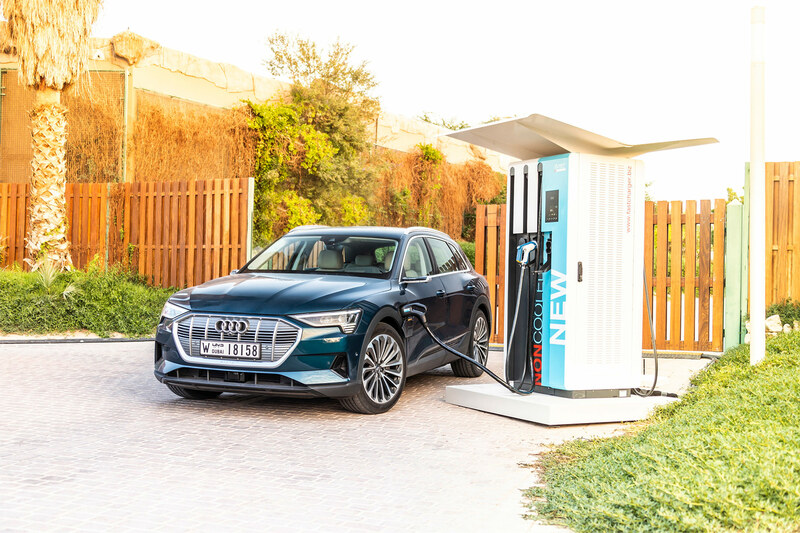 Audi has partnered with Ionity who provides DC fast charging for EVs in Europe up to 150 kW, the German automaker is also working on setting up more contracts with charging providers to enable e-tron users with ease of mobility. 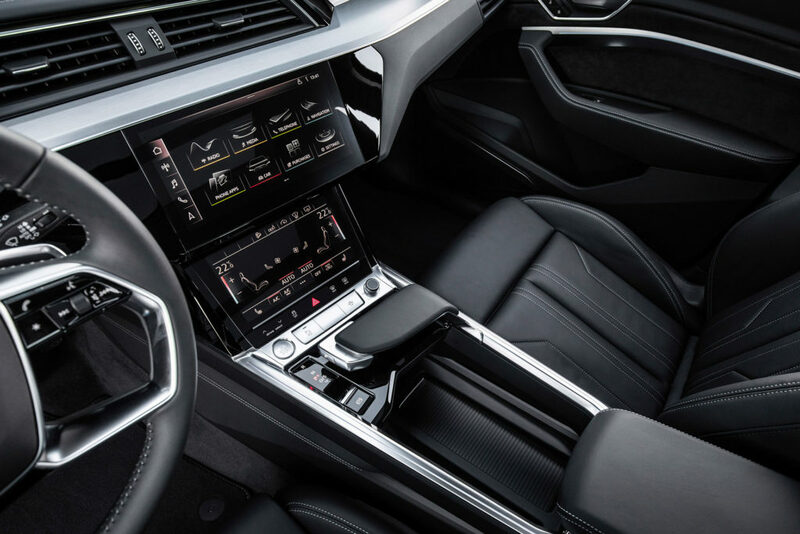 There is no doubt Audi has created a premium look and feel of the interior, especially the multi-tier dashboard — in addition to a large digital instrument cluster there are two center touchscreens, the upper one is 10.1″ and the lower one is 8.6″. The lower touchscreen is used for the seat and climate controls and drive-select (normal/sport), the upper screen has the navigation and multimedia displays etc. The dash uses leather and ultra-soft rubber materials that resonate a luxury finish to the interior. 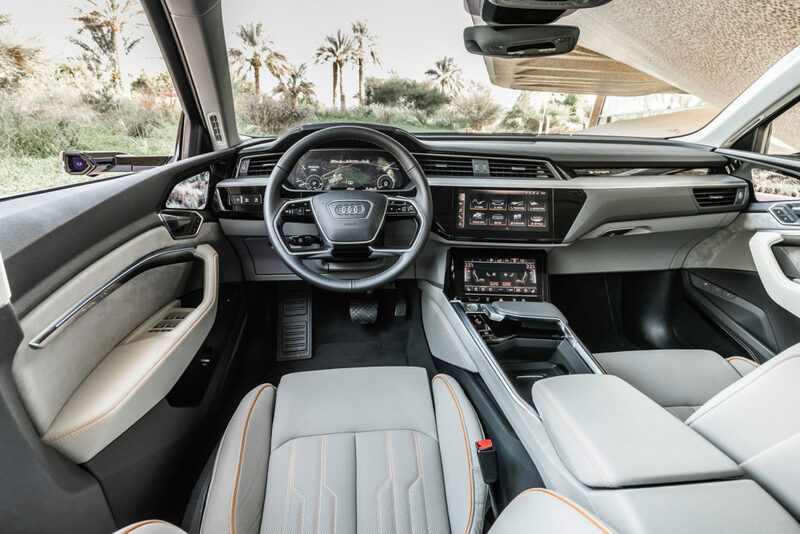 Audi e-tron SUV has a 5 passenger capacity, rear seats have ample space for the backbenchers with their own climate settings, 2 USB ports and a 12 v socket. The front also has 2 USB ports, SD card slot and a SIM card slot and the ability to wirelessly charge your phone. Customers have the option of going with the side-view cameras instead of the traditional mirrors, Audi claims that e-tron is the only mass-produced car using cameras as instead of side mirrors. The camera feed is displayed on 2 small screens on either side of the dash, according to Jonny this is not good user experience, and after watching the video we agree with him. Audi e-tron’s front-trunk is not like a huge Tesla ‘frunk’, it is a small covered space which you will normally use to store your charging cables and adapters, however, the rear trunk space is pretty reasonable i.e. 660 liters (23.3 cu ft). All three rear seats separately foldable to create more space but it does not create a flat floor. Looks like Audi is more focused on retaining their existing customers and not lose them to other electric car makers, the e-tron SUV sits between the Q5 and Q7 lineup in terms of size and luxury, Audi is still not focused on the millennials with their EV platform. Audi has applied a modular approach to the creation of e-tron which literally means they have borrowed the non-EV parts from all over the Audi lineup, like the suspension, front-fascia, and the grill, wheels and more — they did not create an electric vehicle from the ground up like the Jaguar I-Pace. For the starting price of $75,795 that can go significantly higher with the premium options, Audi e-tron is a luxury SUV that’s out of budget for the masses, the less expensive and more creative Jaguar I-Pace ($69,500) would be more appealing to electric SUV enthusiasts. In the near future, all of these fully electric SUVs can get a tough time from the Tesla Model Y at least in the U.S. market, 2nd quarter of this year will be more interesting for automotive and EV enthusiasts, let us know your thoughts in the comments section below.